Nissan has been very active in the motorsports and enthusiast world over the last several weeks, with the NASA Spec Z series announcement, World Challenge, Grand Am, and other series involvement. Now Nissan is going to be building the ultimate track Z with input from its Facebook fans. This could be really cool, or a disaster. Hopefully its not some hellaflush fail build. Knowing whats popular, that is probably how it will end up. All show, no go. Lets see if I am proved wrong. There are already some pretty good templates out there, the supercharged STILLEN 370Z covers most of the bases, forced induction, brakes, suspension, tires, visual, and cooling. Nissan North America, Inc. (NNA) today launched a social media-directed Nissan 370Z build-up called “Project 370Z” at the Chicago Auto Show – where the upcoming 2013 Nissan 370Z is also being previewed. 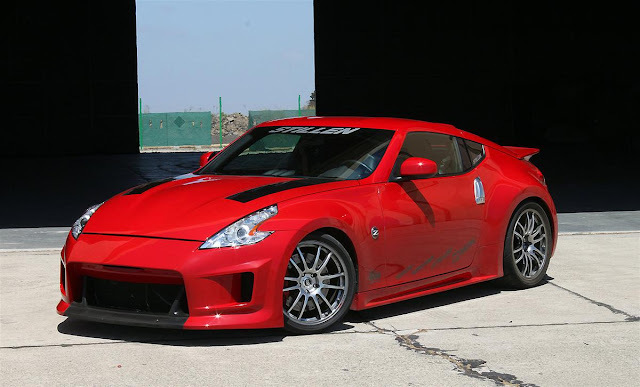 The goal of the project is to utilize the passion and knowledge of Nissan Z® fans online to help direct the creation of a unique, one-off Nissan 370Z utilizing readily available aftermarket parts and accessories. Fans will vote on potential modifications and follow along with the progress online through facebook.com/nissanperformance. Project 370Z will be built in several phases – power, handling/brakes, interior and exterior. Fan Likes, Comments and Wall Posts will be reviewed over the course of each voting session and the part or accessory with the most fan support will be chosen for the build. For example, in the initial Power Phase, fans might vote between a turbocharger or supercharger for the factory 3.7-liter V6. Phase 2 may include suspension and braking system, since the finished vehicle is expected to see substantial track time. Fans will take part and share in every aspect right up until the final design is revealed at its planned debut set for late May at the annual “ZDayZ” event. ZDayZ is an annual Z® car enthusiast gathering that takes place in the Great Smoky Mountains of North Carolina and Tennessee. Each year the event draws hundreds of Nissan Z®, GT-R and other Nissan performance car enthusiasts from all over North America. This year's ZDayZ will be held on May 17-20. Attendees will participate in a car show, exhaust sound-off, dyno competition, group dinners and multiple group drives – including runs on ”The Tail of the Dragon,” which has 318 curves over an 11-mile stretch of scenic Tennessee mountain highway. In addition to its debut at ZDayZ, Project 370Z will be shown at other enthusiast events such as ZCON 2012 and the 2012 SEMA show. The finished 370Z will also be made available for testing by leading enthusiast publications, forums and blogs. The 2013 Nissan 370Z, which goes on sale at Nissan dealers nationwide in June 2012, features a number of enhancements – including a revised front fascia with vertical LED daytime running lights. In North America, Nissan's operations include automotive styling, design, engineering, consumer and corporate financing, sales and marketing, distribution and manufacturing. Nissan is dedicated to improving the environment under the Nissan Green Program 2010 and has been recognized as a 2010 and 2011 ENERGY STAR® Partner of the Year by the U.S Environmental Protection Agency. More information about Nissan in North America and the complete line of Nissan and Infiniti vehicles can be found online at www.NissanUSA.com and www.Infiniti.com. Nissan Motor Co., Ltd., Japan's second largest Japanese automotive company by volume, is headquartered in Yokohama, Japan and is an integral pillar of the Renault-Nissan Alliance. Operating with more than 150,000 employees globally, Nissan provided customers with more than 4 million vehicles in 2010. With a strong commitment to developing exciting and innovative products for all, Nissan delivers a comprehensive range of fuel-efficient and low-emissions vehicles under the Nissan and Infiniti brands. A pioneer in zero emission mobility, Nissan made history with the introduction of the Nissan LEAF, the first affordable, mass-market, pure-electric vehicle and winner of numerous international accolades including the prestigious 2011 European Car of the Year award. The fans know what to vote for. It would not be building a disaster with this project. I'll surely cast my vote well.